As promised, I'm back with a second review on the Zoeva brushes - Rose Golden Vol. 2 Luxury Brush Set. Go check out my previous post on the Classic Face Set and 231 Petit Crease Brush review here. This set comes with 8 brushes - 3 face brushes and 5 eye brushes. You can get this on BeautyBay.com (linked above) with free shipping for S$125.90. 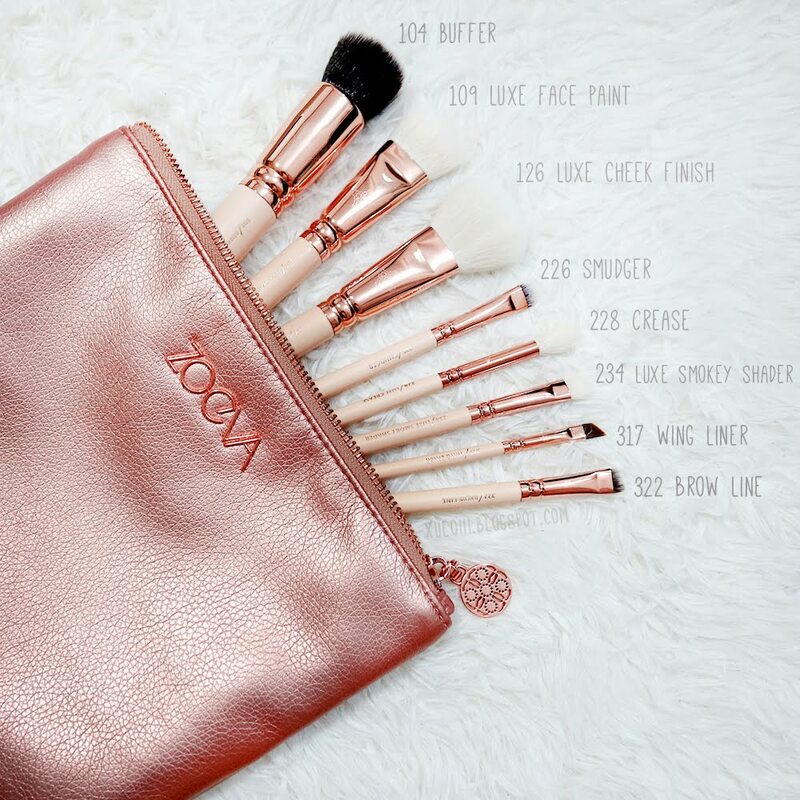 If you are a beginner with makeup and looking for a complete starter brush set, do check out Zoeva's selection of brush sets. The quality of these brushes are better than Sigma in my opinion. Worth investing in. I did buy another 3 brushes from them and will include them in a future post soon - 101 Luxe Face Definer, 222 Luxe All Over Shader, 227 Luxe Soft Definer. 317 Wing Liner Brush - Nylon Bristles. and then softly blend the edges in a circular motion. This is very similar to the Sigma F80 flat top kabuki brush that is holy grail for so many when applying foundation. To be honest, after trying this brush out, I do prefer the Sigma one. This is ever so slightly larger than the F80, and softer as well. Maybe that's why I find it a bit harder to blend in my foundation, especially when I am in a rush in the morning. I much prefer the finish that the F80 gives. The F80 blends out concealer quite well too and is just the right size for an all over base brush. The ZOEVA 104 is too big for my liking. Nonetheless, it is still a good brush and works well. I wouldn't exactly run out to buy the F80 if I only had this to use - that's what I mean. and blend everything softly to a flawless finish. As suggested by ZOEVA, I really like to use this with 'cream' contours - I don't exactly own any cream contours but the Colourpop ones has a creamy texture so it doesn't work too well with very fluffy brushes. This brush blends out the contour very well and I need to use the more! Gently swirl the brush into the powder until the desired amount of pigment is deposited. Tap the brush to remove any excess powder. Using quick light motions, glide the brush across the face for a smooth even distribution. This is quite the multi-tasker brush - one of my favourite brushes from this set. I use this mostly for my contours and bronzing as well as blushes when I'm feeling lazy to switch brushes - I just flip it over and use the other side. You can use this to set your face makeup as well. Smudger Brush is the perfect tool to apply, shade and blend eye shadow and kohl liner along the lash line. I have been loving this on my lower lash line to balance out my shadows. More so on the outer lash line as this can be a bit less precise on the inner corners. Use this brush for the soft blending and shading of pressed powder and loose pigment eye shadow. This is a very fluffy crease brush - perfect to dust a colour all over the lid or to do a soft transition at the crease. I would not recommend this for any precision crease work e.g. cut crease. I much prefer the ZOEVA 231 Petit Crease Brush that I reviewed here, for any outer v crease blending action. This is a typical flat shader brush to pack on shadows on the lid. 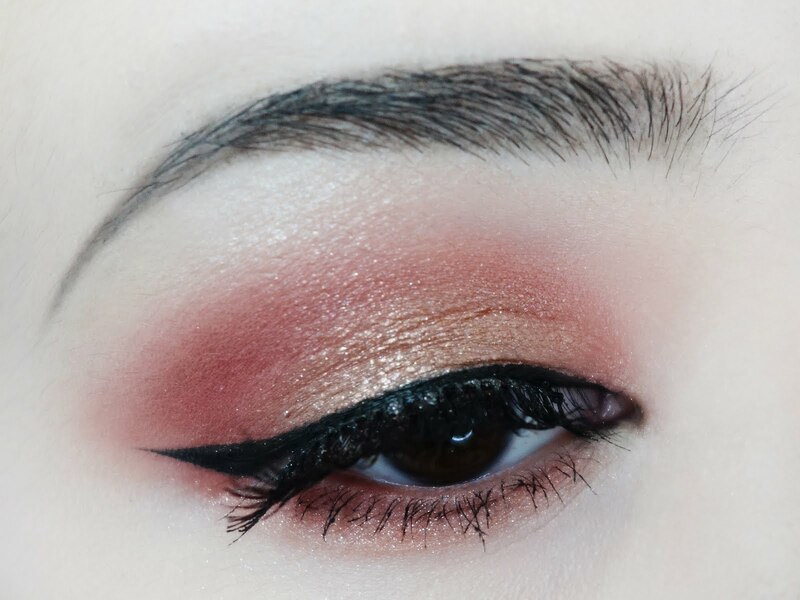 I have no complains and I really like this for packing on shimmery shades all over the lid. glide along your natural lash line in a steady stroke. I use this quite often to either smudge out my liner or use it to apply either a powder liner (wet) or a gel liner. I works amazingly well and the stiffness of the brush is just nice to create that perfect wing. Pick up a small amount of your eyebrow product (matte brown eye shadow is also an option) and draw the outer lines of your eyebrows by following your natural brow shape symmetrically. Then fill in the brows in short, upward strokes. I usually use a pencil to outline and carve out the ends of the brows first, and then use this brush together with a brow powder to lightly fill in the inner part of the brows. The brow powder that I currently love is by TheBalm - Brow Pow Powder in Light Brown.